The first week of First Session featured the beginning of our Orange and Blue competition, clinics, trips to the Craft Shop and of course, lots of fun! Both camps had a special meeting where the Orange and Blue teams were announced and our brand new Camp reversible jerseys were distributed to campers. We’ll have another post soon featuring our Fourth of July Field Days, check back soon! 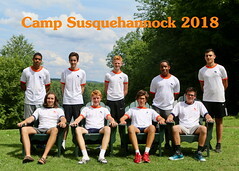 Ask your son and he will tell you Susquehannock has the best looking, most intelligent, and most athletic campers. But, what about the staff? I can tell you they are the most empathetic, enthusiastic and cooperative staff. Notice experience is not mentioned; that’s because even our “new”staff members are returnees with plenty of Susquehannock experience. 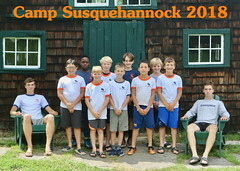 A Camp Susquehannock counselor’s days are jam packed. Most rise to the sound of first bell in the morning and a cabin full of sleepy young faces. A select few are already awake for an early morning run or swim. Following breakfast they oversee the beautification of their cabins. Then it’s a morning packed with instructing everything from soccer and tennis to swimming and archery. Supervising Rest Hour after lunch is far from the nap that many counselors long for. When the call for all coaches, players and officials to report to afternoon activities is announced, some counselors are energetically pacing the sidelines encouraging the kids, while others are racing up and down the field officiating. Afternoon free swim requires the full focus of some, while others are on the hill top playing impromptu games. Then again after the evening meal coaches and officials are called upon to join campers in another round of Orange vs Blue competition. Bells ring to let counselors know it is time to get the campers ready for bed. When young heads finally come to rest on pillows, counselors are found on doorsteps or lying on beds enjoying a few moments of relaxation before drifting off to sleep themselves. The energy that surges through these young men is endless. They are not professional educators; however, they possess an ability to engage campers mentally, physically, and emotionally. Counselors are on duty 24 hours a day, seven days a week, tending not only to the athletic development of campers, but teaching life skills that will benefitcampers long after their summers at camp end. I look forward to an exciting summer and consider myself lucky to work with great kids and a great staff. We began our 25th summer at S4G with many fond remembrances of summers past and anticipation of the summers to come. Old camp friendships picked up where they left off and we welcomed new campers to our family. 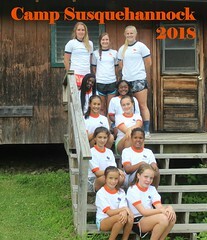 The stellar S4G staff not only worked to prepare the facilities for the season, these young women devoted themselves to creating exciting activities focused on providing our campers with a wide experience of teamwork, creativity and appreciation of the natural world. We have enjoyed beautiful, sunny days and cool nights these first few days and activities began with World Games on Monday with campers playing on all fields in mixed age groups. After the spirited competition of the day, the teams presented cheers. For those of you who have not experienced these cheers, they provide some of the highlights of each camp session. To celebrate the the founding of S4G in 1986, the Pink Team presented their conception of cheers from 1986, 1996, 2006 and the future. After World Games, the Orange and Blue teams were announced and the competition for the session began with highly competitive games. This year, the head coaches of the Orange and Blue teams, Clare Mahoney and Holly Bailey, presented each of their team member with a reversible, orange and blue, pinnie to wear during the games. We have already seen close competition and the winner of the competition will be announced at the always memorable Orange and Blue Banquet during the last week of camp. 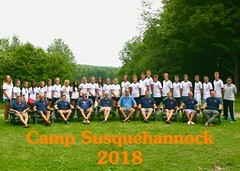 I am deeply grateful to be a part of the Camp Susquehannock family. In our conversations among the S4G Staff, we continually reflect on how fortunate we are to have a part in the growth and development of the campers. Every season, we see these young women face challenges and opportunities. We recognize and celebrate their determination and successes and look forward to sharing it with you as the camp season continues. Before we can create our Orange and Blue teams, campers are placed on either Team A or Team B for a group of evaluation contests called World Games. The campers are also given the task of producing a team cheer to be judged before a spirited game of Run Rabbit, Run. Whether this is your first time visiting this site or you’re a Grizzled Veteran of these posts, welcome back to the Tripp Lake Times! We are planning to bring even more photos, videos, songs and special event recaps in the coming weeks, so please check back often. Our 2011 First Session opened with beautiful sunshine, happy reunions, new arrivals and of course, lots of fun! After moving into cabins, campers jumped right into the games and visited Tripp Lake for the first of many times this summer. 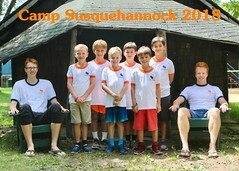 With a delicious dinner consumed, Directors Win and Cannie Shafer, along with the Senior Staff and counseling staff welcomed the campers on the porch of the boys’ Lodge and passed along valuable information about life at Susquehannock. The Boys camp then rounded out the day with a game of Dodgeball, as recent tradition dictates. The girls, after going back down the Hill, were treated to skits by their counselors. The first full day of First Session began with World Games in both Camps, as we try to create balanced Orange and Blue teams. Once again, welcome back to the TLT and please check back often for updates, in addition to following the action at Susquehannock on our other social media outlets! For the second straight year, a group of counselors gathered at Camp over New Years for a few days of ice hockey on Tripp Lake. What does Camp look like during the winter? Click on the following slideshow for a glimpse! Coming close on the heels of New Year celebrations, the annual Camp Winter Reunion always is a great way to spend a winter’s day. This year we gathered on Sunday, January 9th for a few hours of good friends and (hopefully) good bowling. Thanks to Mary Powell for the photos! Happy holidays! We sincerely hope that your holiday season is peaceful and enjoyable in every way. In recent years foot traffic at camp fairs has steadily declined, since families prefer to do their summer camp research online. Therefore we have decided to reduce our camp fair appearances in favor of planning more intimate events for interested families. We are asking for your help in setting up these Camp Open House gatherings. We have found that attendance is directly related to family-to-family invitations, as opposed to invitations sent by a Camp representative. It also may be helpful to plan an event with a group of other Camp families that live near you and pool resources. No matter where your home is located, we will make sure that staff and materials are available at any such event, coast-to-coast. I personally am willing to travel anywhere if it’s a good chance to spread the word about Susquehannock. We’ve already had one Open House thus far this off-season and this was a rousing success. 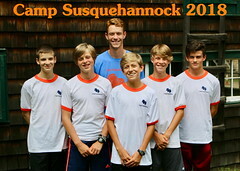 The best part is that the host family wasn’t even a current Susquehannock family. They had made the decision to send their children in 2011 and invited a dozen or so of their friends with children over to their home. We played the award-winning Camp video, did a short Q&A session, handed out brochures and that concluded the event. All in all, we gained four new campers from this hour-long gathering. We know you already love Susquehannock, so imagine how successful an Open House Event could be at your home. These Open House events are crucial in helping Susquehannock to successfully market itself in the off-season. I am available to discuss and help out in any way that I can, so please feel free to contact me via email (josho@susquehannock.com) or phone (518) 424-5701. Our Susquehannock families are the best advocates that we have, let’s really increase our efforts to spread the word this off-season! 05 Dec New Camp Webpage Launched! Thanks to the continued hard work of Rob Kent, Ames Parsons, Tarryn Rozen, Cannie Shafer and Paul Travis: the newly redesigned Susquehannock webpage is now available.